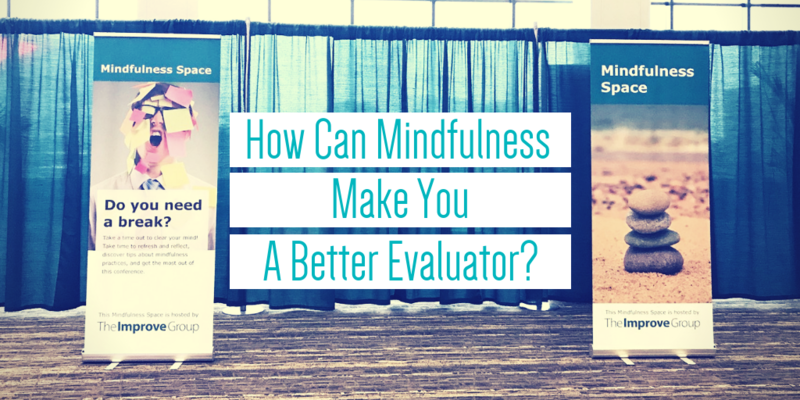 How Can Mindfulness Make you a Better Evaluator? Earlier this fall at the American Evaluation Association conference in Cleveland, The Improve Group hosted a Mindfulness Space. In partnership with AEA, we created a calm space near some natural light (and a surprise urban farm in the area outside!) with meditation resources, an activities table, fruit-infused water, and other resources for mindfulness. We see mindfulness as closely tied with our value of thoughtfulness and wanted to create a space for conference attendees to take a mindful moment amid the conference. It can help me to be focused and less stressed, which will hopefully improve my role as an evaluator. Gives my brain space to reflect and improve my practice—what is my intention as an evaluator, in this space? Mindfulness enables me to be fully engaged during all aspects of the evaluation, leading to more accurate measurements and meaningful results. Mindfulness helps me reduce self-judgment about my evaluation skills. Thanks to everyone who visited our Mindfulness Space for meditation, a meaningful conversation, coloring, or just for a moment of peace!